All coaching positions filled. Now it's time to play, Whose my quarterback?!?! Several NFL teams have some decisions to make, including the Super Bowl bound Arizona Cardinals. From young quarterbacks making guaranteed dollars riding the pine, to the free-agents to be, these signal callers are about to make major dollars and play major roles in the off season. Matt Cassel The once thought to be heir-apparent to The Golden Boy, Cassel has transformed himself into the most sought after quarterback in the 2009 offseason. With major questions surrounding the health of New England's adopted son, Tom Brady, Cassel has become valuable to both the Pats and any franchise looking for a supposed front line starting quarterback. 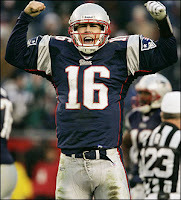 Starting under center in 2008, Cassel was able to rally the Patriots to an 11-5 regular season finish. With Cassel becoming a free agent in 2009, the New England Patriots will be forced to place the franchise tag on the 26-year old quarterback if they want to keep him in any fashion. A franchise tag will place two of the top five highest paid quarterbacks in the NFL on one roster, Cassel and Tom Brady. Knowing the way Bill Belichick does business, that won't last long. A couple things to remember: (1) The Patriots spent a third round draft pick on San Diego State quarterback, Kevin O'Connell, in the 2008 NFL Draft. Before the injury to Tom Brady, Matt Cassel was not in the plans for 2009 when he would be looking at free agency. (2) Finishing 11-5 with a quarterback who had very little NFL experience at the start of the season, has given Bill some confidence in life after Tom, I doubt he doesn't think he can duplicate his efforts with O'Connell. (3) The Patriots defense was exposed in 2008, with the draft picks that a trade including Cassel would bring; New England would be able to instantly address their long in the tooth defense. Finally, if your looking for a landing spot for Cassel, of course Minnesota would be ideal, a running game with above average receivers intact. With Brad Childress dying for a viable quarterback, I wouldn't be shocked if the Vikings gave up nothing short of a King's Ransom for young confident signal caller. Don't be shocked if the Patriots go into a second straight season with an inexperienced quarterback under center. 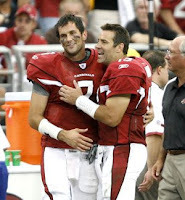 Kurt Warner or Matt Leinart For a time in 2008, Kurt Warner was a viable MVP candidate. Now that he has marched the Cardinals all the way to the Super Bowl, I ask you: What more are you attempting with him under center? If Warner wants, he'll easily be able to latch on to a team looking for a veteran quarterback, and they'll be willing to pay him top dollar. Why should the Cardinals? Right now, Arizona is dedicating $14 million dollars to two quarterbacks. Judging by their rushing attack in the regular season, they have more glaring needs. Warner is 37 years old, Leinart is 25. If the Cardinals are going to ever hand the keys over to the third year quarterback from USC, the time is now. The franchise could never be hotter, the entire team including Larry Fitzgerald has never played with as much confidence, and by handing the keys over to Matt Leinart now, you get a clearer picture on whether or not he is your guy for the future. By resigning Kurt Warner, who is going to demand close to what he is making now, your still on the hook for another $14 million in 2009 to the both to of them, delaying your Leinart decision another year. I can't stress how much of a good soldier Leinart has been, he must have been able to pick up on the struggles Warner went through to get to the NFL, and I'm sure he is awaiting his opportunity. With Steve Breaston, Larry Fitzgerald, and even Tim Hightower, Leinart will have some weapons to work with. Then Kurt Warner can look toward either retirement, knowing he has nothing left to accomplish and await his seat in Canton, or he could sign on with a team like Tampa, who could look to make a quarterback change or even Minnesota, a dome team with Kurt Warner, I think we've seen what that leads to by now. Kerry Collins or Vince Young I don't think Vince Young is the answer, I'm not sure the Titans do either. Luckily, the Titans have a back up plan in place. Phil's kid, Chris Simms. Vince Young, like Matt Leinart, got outplayed for his starting position, sure an injury finally did him in, but in 2008 it was clear that Kerry Collins could lead the Titans further than Young would have. Vince hasn't been . able to enjoy the fortunes of Chris Johnson, the rookie out of East Carolina who rushed for 1,200 yards and scored 9 touchdowns. Johnson could do two things for Young's career, the rushing attack allows Vince to develop rather than have to go out and win games, like Matt Ryan was able to do this year. Secondly, it forces defense to respect the run and give his receivers one-on-one coverage, giving Young another opportunity to make some plays. All Kerry Collins had to do this season was complete 14-20 passes a game, keep the ball out of harms way, and let the defense set up some great field position. He would be entering his 15th season by the start of the 2009 season, cut him loose, and hand it over to Vince now, before his confidence is wounded anymore. I don't know how much money Collins could demand as a free agent, but I bet the Patriots, Cowboys, and the Jets could use a veteran back up who could step in at any time. Matt Hasselbeck The oft-injured, 33-year old Seahawk, isn't Kurt Warner or Kerry Collins, he's got it left in the tank. With an above average running game and 1 or 2 targets, the nearly 4,000 yard passer in 2007, should be back. With a new head coach in line, Jim Mora, not the "Playoffs!?!?!" Jim Mora, his kid, I've got one thing to say, KEEP HASSELBECK. If your looking for a quarterback out there because you don't believe in Seneca Wallace, draft one in the late rounds, but by all means KEEP HASSELBECK. Here's a guy who has gone over the 3,000 yard milestone five times with Mike Holmgren, and ask yourself, who was catching the ball?!?!?! Koren Robinson? Sure, they had the years with Shaun Alexander, but running backs are a dime a dozen in the NFL. If you do as I told you to several weeks back, and draft Texas Tech Red Raider, Michael Crabtree, you instantly improve your pass offense. A healthy Hasselbeck, and who knows what you could have on offense. But if you decide to move in a different direction, perhaps defense, with Mora Jr. being a defensive guy, then you'll have many people looking at Hasselbeck. All offering to give up more than you'd think. Mark Sanchez or Matt Stafford Why do we have to discuss two quarterbacks who haven't taken a snap in the NFL? Because between offensive rookie of the year, Matt Ryan, and Raven stud quarterback, Joe Flacco, the first year qb's picked up a combined 22 wins. Your probably right though, what are the odds that these two guys, Stafford and Sanchez, can duplicate their predecessors success? Both quarterbacks were standouts on top notch collegiate football programs, Sanchez at the almighty USC, and Stafford with the Georgia Bulldogs. When Matt Ryan came from oft-disrespected Boston College, and Joe Flacco from division I-AA, Delaware. Sanchez did not get the blessing from head coach Pete Carroll, who made it very public that he did not think Sanchez was pro ready. As for Stafford, while reaching his career high in passing yards (3,459) he threw the same amount of interceptions as he had the season before and was sacked two more times, holding on to the ball is not an option in The League. In my opinion, neither of these quarterbacks are worthy of a top ten selection and the dollars that come with it. Mark Sanchez and Matt Stafford aren't as much of a finished product as Ryan was, and neither show the same physical skills as Joe Flacco did. With Detroit being the only team in need of a signal caller in the top ten, it's possible they could pass as well, having the Cowboys pick later in the first round. Buyer be FULLY AWARE, stay away from Sanchez and Stafford as of right now. Donovan F. McNabb The pride of Philly, when he wants to be. From the moment Philly fans booed him on draft day, McNabb has never won over their respect. Now 1-4 in the NFC championship games, McNabb is quickly becoming the Jim Kelly of this century. What Philadelphia is, is Donovan McNabb, what they aren't, is a team with a coach that can put them over the top. McNabb has been given one actual threat, T.O. in his prime, since then he's had to rely on Brian Westbrook, and its no wonder that when Westbrook goes down, McNabb is left holding an unloaded gun. Just like Gruden lost his job in Tampa, Reid's job in Philly has to be on the line, if it isn't, Donovan's won't be either. Fire Reid, send Donovan to a team with some weapons, like Adrian Peterson. Round and round we go, as the quarterbacks spin on the carousel.